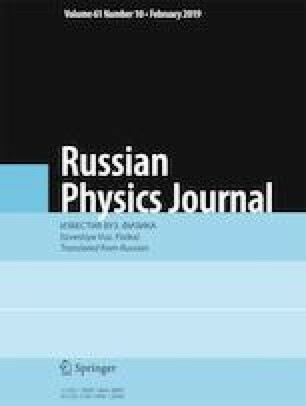 Results of investigation of the spectral-luminescent and lasing characteristics of films based on methacrylates doped with pyrromethene 567 lasing in the yellow-green spectral range are presented. It is shown that incorporation of an additional layer, which improves the waveguide properties of the thin-film structure based on polymethylmethacrylate, increases the energy conversion efficiency and substantially reduces in different degrees the lasing threshold of the examined structures equal to 50–250 kW/cm2. In the structure with additional layer, an efficiency of 60% comparable to blocks of solid-state laser-active elements of organic lasers is obtained. Translated from Izvestiya Vysshikh Uchebnykh Zavedenii, Fizika, No. 12, pp. 135–141, December, 2018.